Every single day in our lives, we tend to use the computer to write, to print, to store and to research the internet. This means our computers today hold a crazy amount of data. This data is very important to our everyday life and therefore should not fall into the wrong hands. In our Bitdefender 2018 Products Review, you will see that compared to other software’s this particular one offers you protection to any kind of threat you could imagine of. Using Bitdefender, you will not be worried about issues like malware, or ransomware which are our greatest threats today. Bitdefender was launched in 2001 in Romania and has set up shop in over 100 countries. It is a re-branding of internet security software called AntiVirus eXpert (AVX), produced by SOFTWIN. This software used behavioral based blocking technology. This makes Bitdefender one of the best on the market today. New Advanced threat defense – Added new behavioral based technology to detect and block advance threats and ransomware. Added new webcam protection for Windows. Improved Password Manager, Safe files, File Shredder, Parental advisor & Firewall. Added parental advisor for Mac OS. Added Safe files for Mac OS. Downloading and installing BitDefender 2018 can be done by simply using the download and installation kit. In order to do so there are few steps you need to follow. You can decide to download the installation package on your current computer or another computer. If the installation is for another computer with a different operating system, be sure to select the preferred system and then download. An email will be asked please fill it in the form and press SEND. 4. A download will begin and will take a few minutes depending on the speed of your internet. Upon finishing you should run the installer. 5. Before proceeding please choose your preferred language. 6. Upon completing your preferences click INSTALL upon completion of the installation a summary will be displayed and if there was any malware removed a reboot will be required. 7. To continue click the START USING Bitdefender button. The Subscription plan shall give you details of your active subscription. 8. Just Click the FINISH button when the process is done. Two-way application scanner: the software has been upgraded and now helps to monitor not only incoming connections but also the outgoing one. BitDefender is an anti-virus in its own category. It comes with more features unseen in other antivirus software. Below we give you the other functionalities with a simple description. Filed shredder: This functionality makes it impossible for one to recover files that you have permanently deleted from your computer. Hosts file scanner: This application helps you to block unwanted websites or applications from communicating with their upgrading servers. Security Widget: This displays one’s computer health and corresponding computer protection level. Password manager and wallet: This comes in handy for anyone who has multiple passwords it helps you to keep them in one accessible pool. Safe Pay: a handy application that allows you to safely transact online using a separate window to help log in to a transaction is a safety catch. 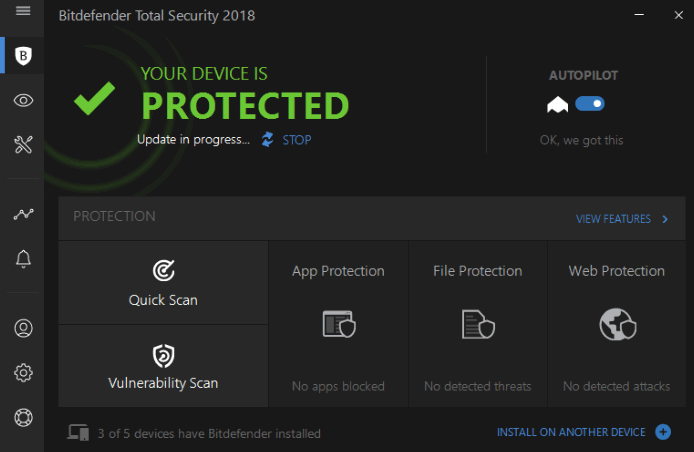 Like all other software’s Bitdefender 2018 requires some specifications on a computer in order to install it properly. The good thing about this software is it is compatible with all new Microsoft operating systems such as Windows 7 Service Pack 1, Windows 8.1 and Windows 10. The downside to it though, is BitDefender 2018 cannot be installed on earlier Microsoft operating systems such as Windows XP and even some later ones like the Windows Vista operating systems. In order to enjoy BitDefender on Windows XP or Windows Vista it is best to download and install BitDefender Security for XP and Vista which can be downloaded for free as a trial version from their official site. Another beauty about BitDefender 2018 is that it is also compatible with Mac which would bring a smile to all Apple lovers. But also any Mac owner should be running at least have a machine running the OSX Mavericks (10.9.5). Other available options for the Mac operating system is the OS X Yosemite (10.10), OS X EI Capitan (10.11) and in the latest in the production line the MacOS Sierra (versin 10.12). For any Android user, one can use BitDefender Mobile Security, but your device should be running Android 3.0 Honey comb. One huddle to jump is that you will need running internet to do any malware scanning. The APK version of BitDefender can be found on Google Play store. BitDefender come comes with an amazing range of features at a very pocket-friendly price. Opting to use BitDefender as your computer protection software, you will have entrusted your data with an excellent solution. With just $89.99 a year, one can purchase a subscription for five Windows, Mac OS or Android running systems. At 99.99 you can even get yourself ten licenses and by simply digging in your pocket you can get your hands on an unlimited license pack for $119.99 for your information these are always discounted. To check out the discount please visit Antivirus Discounts and Promos. It comes with a fast and easily usable interface. The number of fake positive alerts is way lower than another antivirus. It has minimal impact on computer resources. Comes with security features unseen on other competing software. BitDefender has a stunning anti-ransomware protection. Its activation is centered on Internet Explorer therefore; no other browser can work in this instance. BitDefender 2018 is a great antivirus that comes with a great list of features coupled with great support. BitDefender is one of the best antiviruses on the market today but this does not mean that there is no other performing antivirus some even a bit cheaper and with high amounts of licenses.